Properties in Tairua average 4.6 out of 5 stars. Property 1: Tironui. Stunning ocean, harbour and island views. Property 2: Estuary edge in private estate. Property 6: Paku Paradise, Tairua. Property 7: Cute, comfortable, clean and self-contained. Incomparable Ocean & Island Views. Walk to the Beach. Property 14: Incomparable Ocean & Island Views. Walk to the Beach. 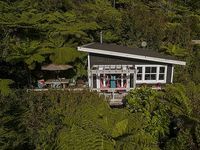 Property 17: Tairua Treasure - amazing place to unwind. Beach and ocean views in every room. Property 23: Beach and ocean views in every room. Property 30: Stunning location! Breathtaking views! 3 minute walk to beach or sit on the deck and listen to the waves. Property 34: 3 minute walk to beach or sit on the deck and listen to the waves. 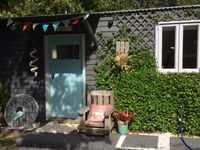 This is a lovely caravan situated above Tairua. The view overlooking the Tairua area is beautiful. Lyndon greeted us and showed us the caravan facilities. We were very comfortable and felt very welcome.